Eddy covariance (EC) is a popular technique to measure and calculate CO2/H2O and other trace-gas fluxes in the atmospheric boundary layer. A typical workflow of a large network involves setting up and maintaining instruments, collecting high-frequency data, post-processing that data, and finally publishing data. The EasyFlux™ software suite streamlines this process. The interaction of the suite's products and their descriptions are below. SND correction to derive sensible heat flux from sonic sensible heat flux. Additionally, directly measured and corrected sensible heat flux is available for studies on energy balance. When used in conjunction with the five Campbell Scientific eddy-covariance systems, the EasyFlux suite offers the FLUXNET community an easy, systematic approach to high-frequency data processing, data management, and network communication. 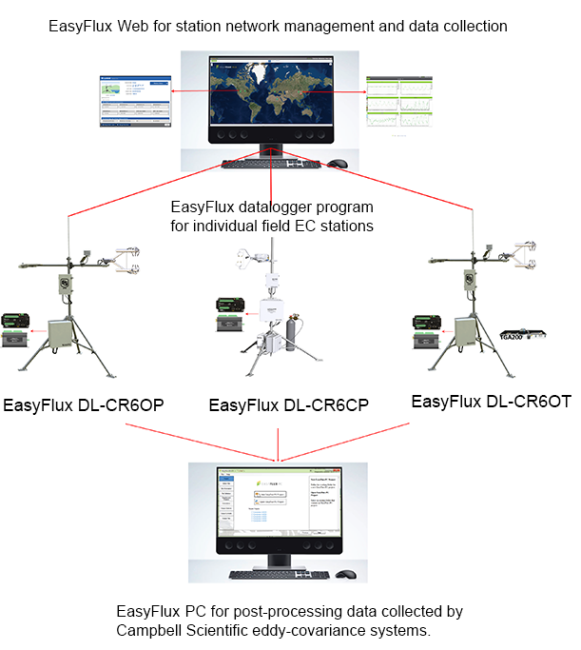 Each of the five eddy-covariance systems has a unique EasyFlux DL program that is supported by EasyFlux PC and EasyFlux Web.